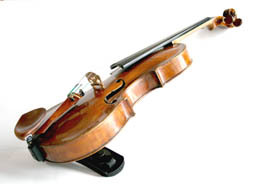 The invention offers a solution for stopping the physical factors that cause problems for tuning and adjusting the instrument. ie. tailpiece. The accessories don't inhibit the instrument's free resonation and our equipment doesn't leave a mark or harm the instrument. 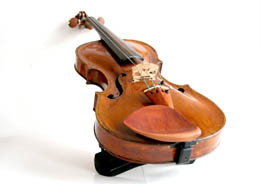 The versatile adjustments give the possibility to hold the instrument in the most comfortable, natural way. The result of this is that it's no longer necessary to make small adustments in posture in the middle of playing, which after awhile may lead to pain and anatomical changes. This solution is a publicly patented invention. The name PerTech originates from the foreign language "perfect technology" word combination.